Posted on February 14, 2019 by William A. 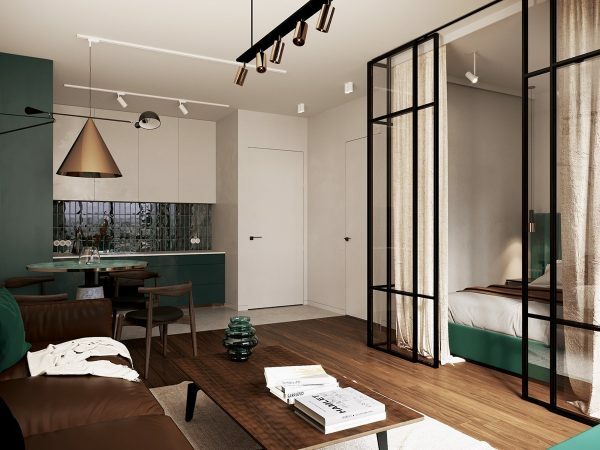 Space may be limited but style is not in these three deluxe studio apartment interiors. 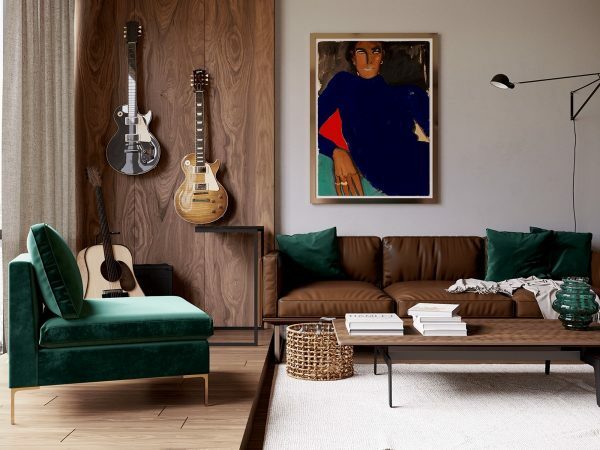 Tour number one takes us to the emerald green and earthy brown home of a musician. 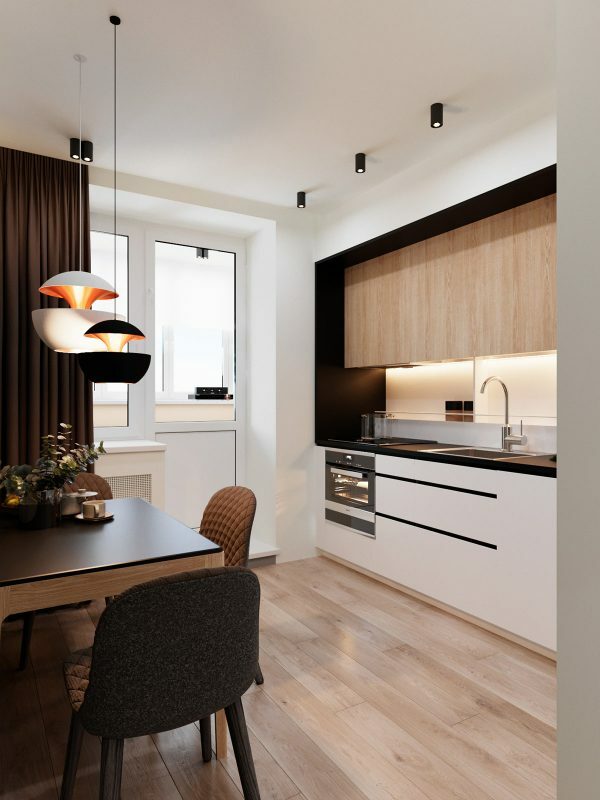 Apartment number two offers up a gutsy charcoal and chocolate decor scheme with white and wood tone to lighten and brighten. 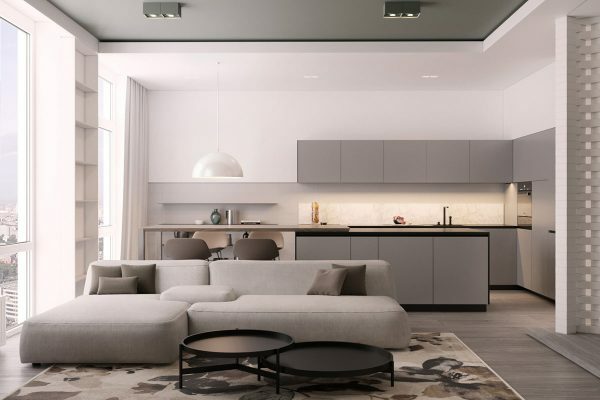 Finishing up in home number three we visit a smooth grey and white interior, capped with a grey ceiling. 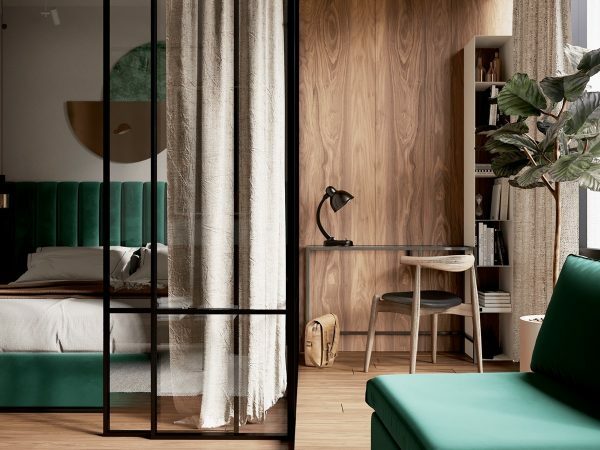 All of the layouts approach an open plan bedroom in a slightly different way; see how to fashion a glass wall bedroom, a slimline bedroom screen, and a sleeping capsule with a sculptural dividing wall and a portiere for privacy. 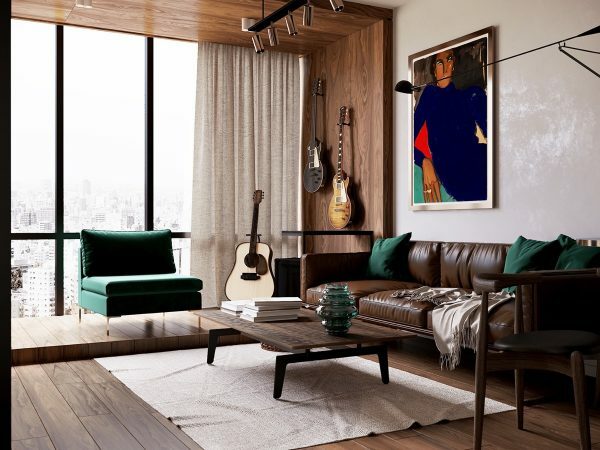 Flashes of emerald green strike through this earthy brown living room, which was designed for a young couple. 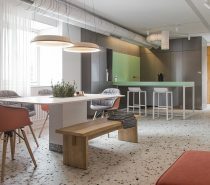 The 50 square meter flat has music themed decor, with a special section of the room separated off for the purpose of playing and displaying a guitar collection. 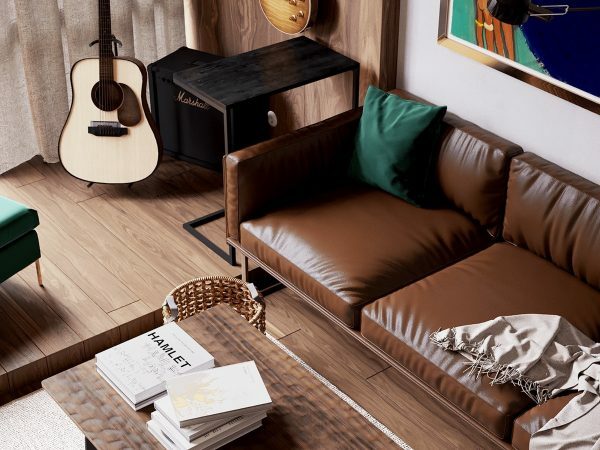 The visual divide between the music area and the lounge is achieved by cladding the guitar display wall in rich wood and slightly raising the floor height, like a stage – perfect for the home of a musician. Colourful art decorates the lounge wall, alongside an en vogue swing arm wall lamp, which is the Flos Mod 265 style lamp. Original is available here. 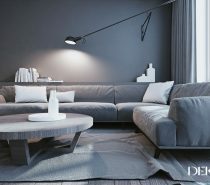 A side table serves both the sofa and the music area. 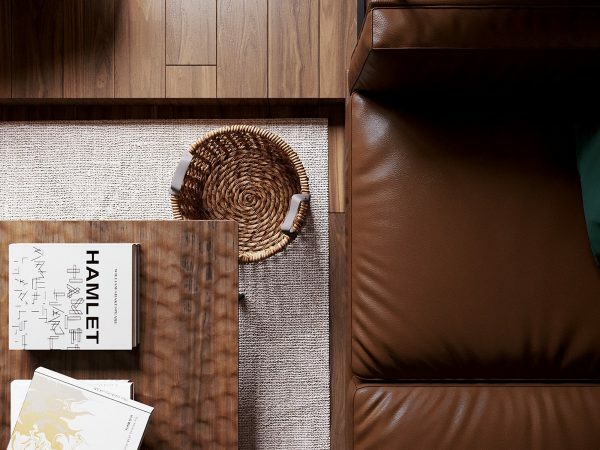 A wicker storage basket and a woven rug complements the natural wood in the scheme. 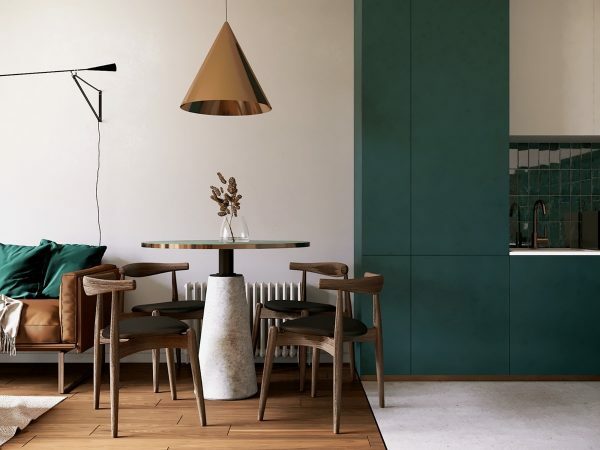 There is a dining area adjacent to the sofa, where a copper cone shaped pendant light descends over a copper edged table. 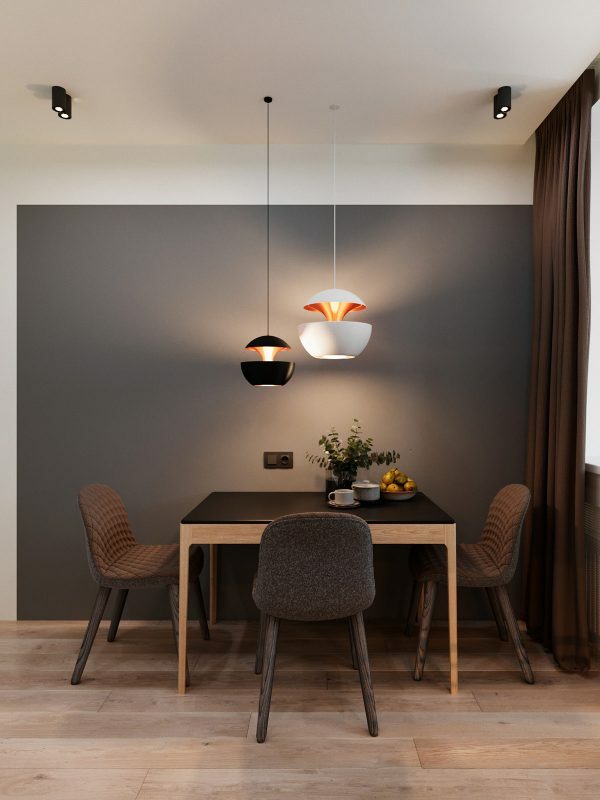 See more fabulous dining room pendant lights here. 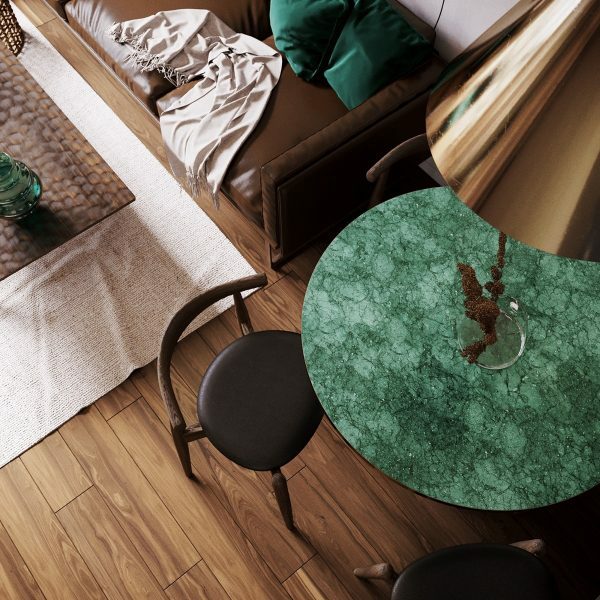 The table is topped with green marble. Opposite the lounge there is a glass wall bedroom, held in a solid black frame. 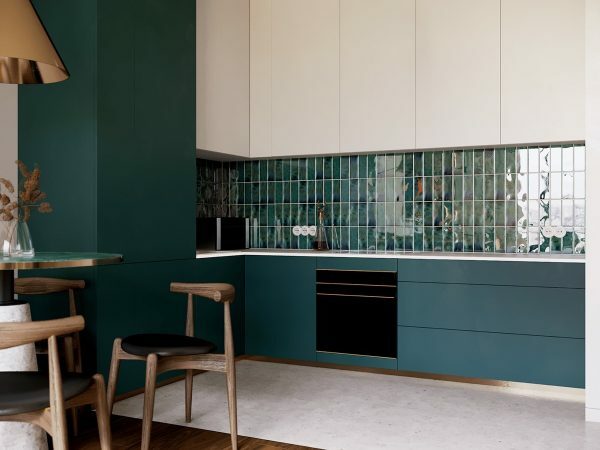 White wall cabinets lighten the look of a green kitchen. 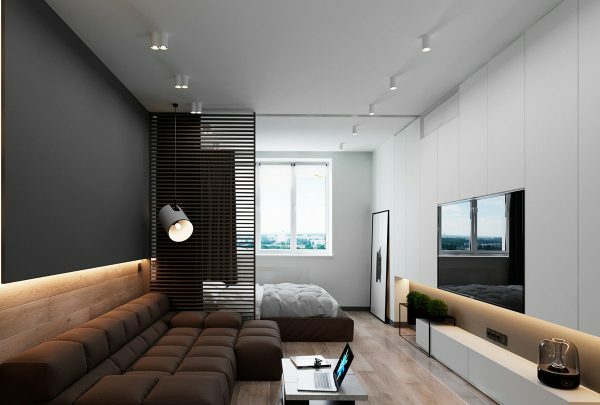 The black framed glass wall around the bedroom has been made to match the main window frames. A minimalist workspace nestles by the windows of the apartment. A tall indoor plant acts as a subtle divider between the home office and the music area. 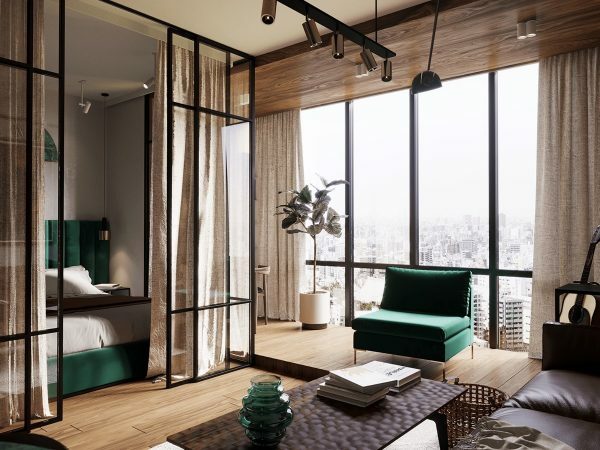 Privacy curtains hang inside the transparent bedroom walls. 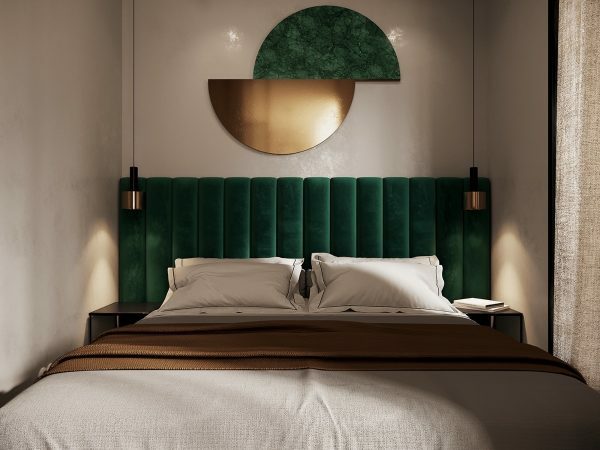 A green bed rests in the bedroom. A piece of colour coordinated green marble and copper art adorns the wall. 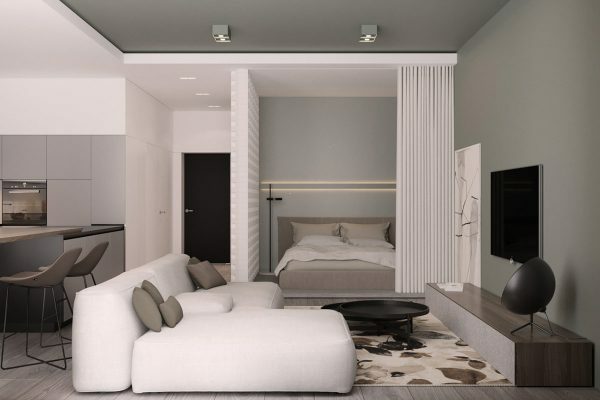 Small bedroom pendant lights illuminate each bedside. 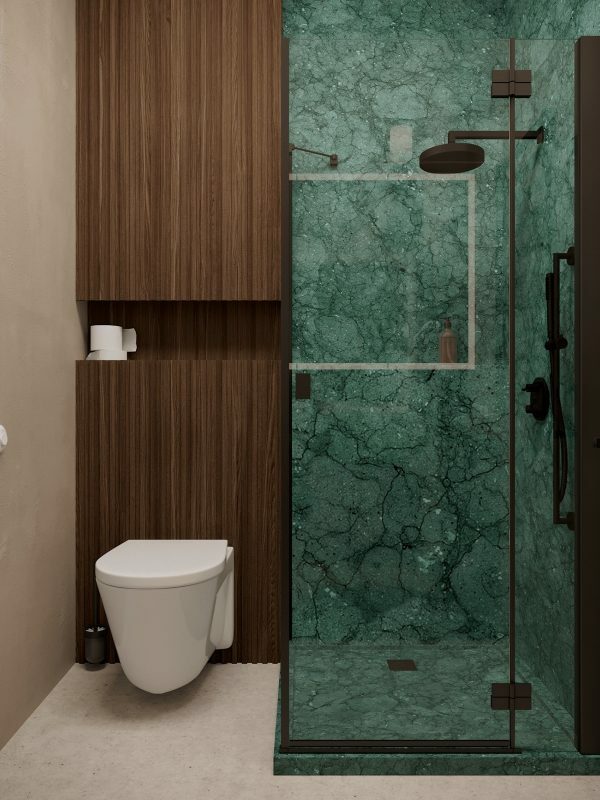 The green accent colour continues through into the bathroom, splashing over a shower wet wall. 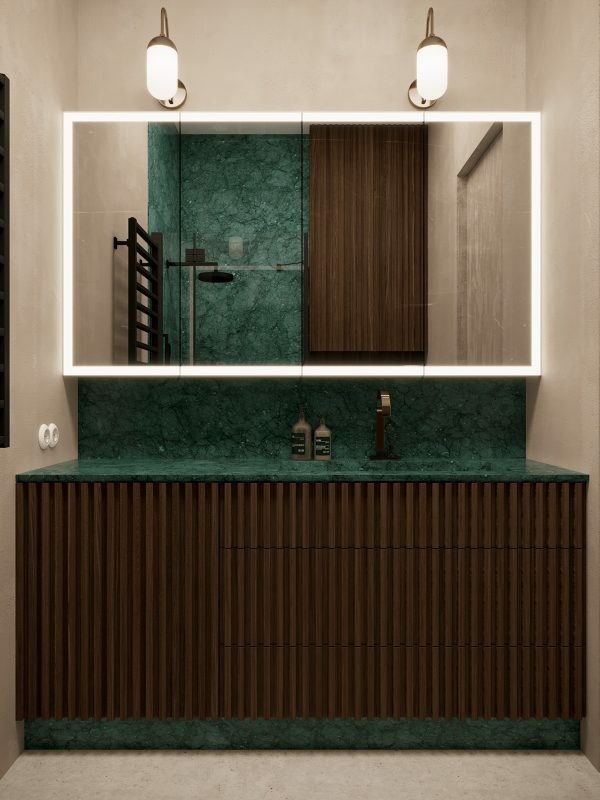 A customised vanity has a green marble backsplash, countertop and kickboard to match. The bathroom cabinet is lit brightly around its edge to counteract the dark colours in the scheme. A set of bathroom vanity lights add to the glow. 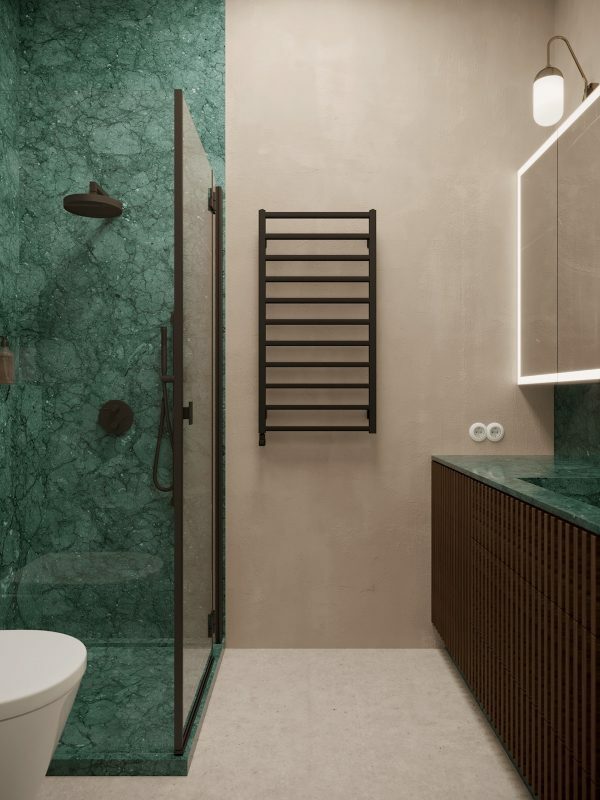 A black heated towel rail ties in with the black frame of the shower enclosure. 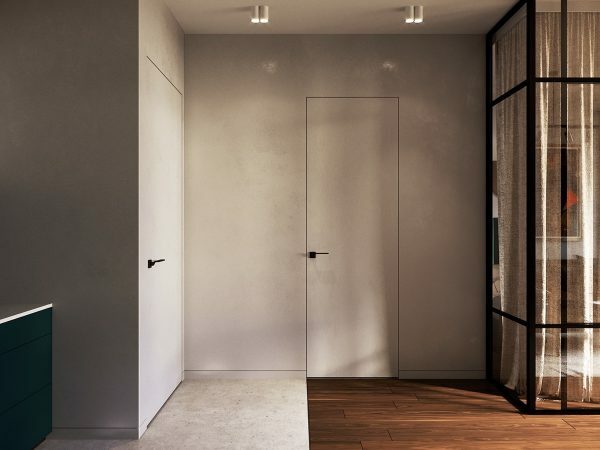 Interior doors are quietly colour matched to the pale walls. 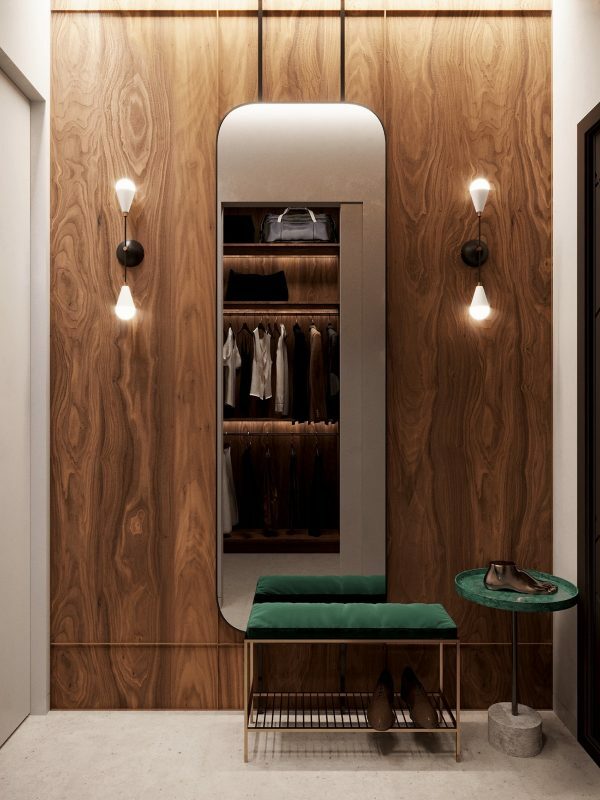 Modern wall sconces accentuate a full length mirror, which hangs outside of a walk-in closet. Doors slide away to reveal the walk-in. 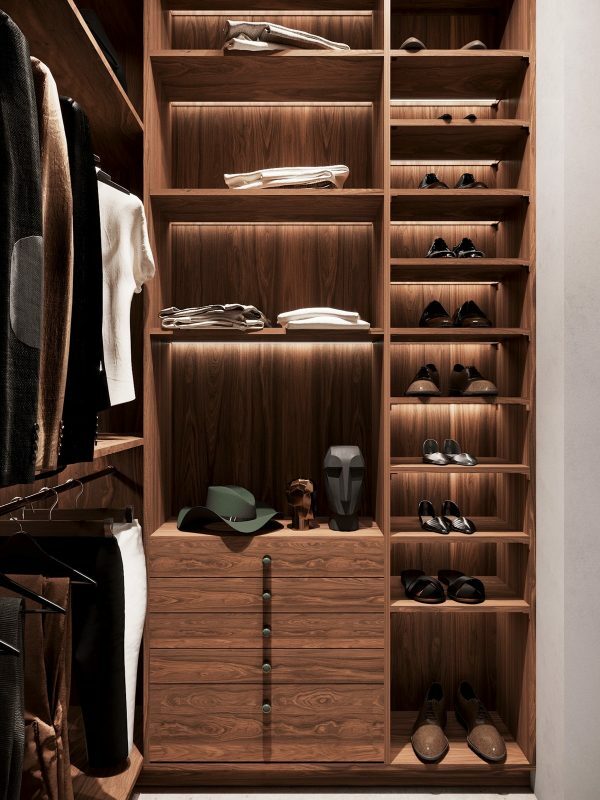 The space is kitted out with a luxurious wooden closet system. LED strips illuminate the shelves. 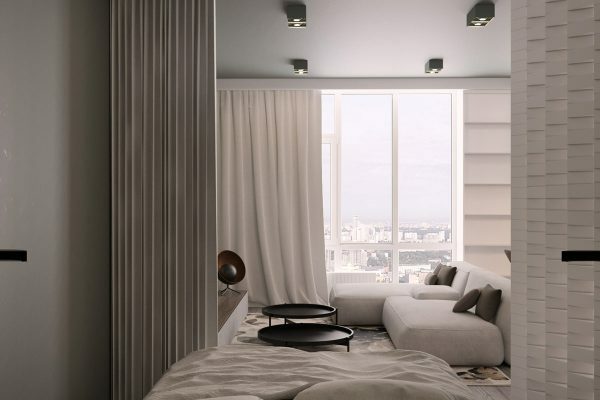 Our next small apartment, located in Brovary, Kyiv, has a total area of 42 square metres. 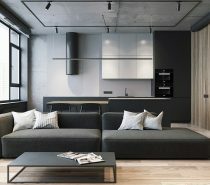 A slimline partition screen separates the bed from a modern sofa. Extra daylight can reach the lounge area via the the slatted bedroom screen by day. By night, a privacy curtain can be drawn across a track the full width of the lounge to keep the sleeping area cosy. 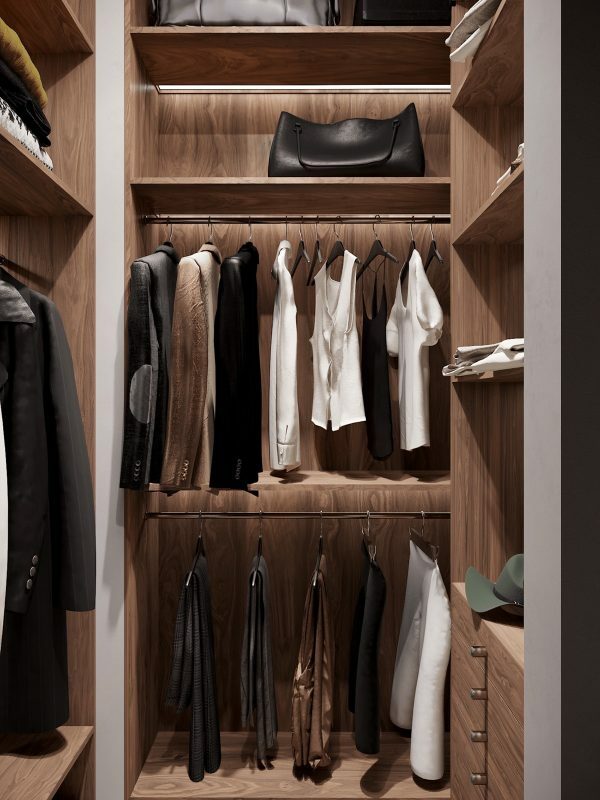 An enormous amount of hidden storage resides behind flat white cupboard doors on the tv wall. 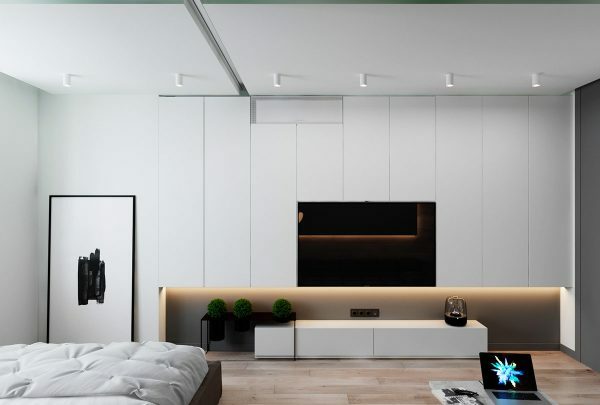 A sleek white media unit occupies the void left beneath. 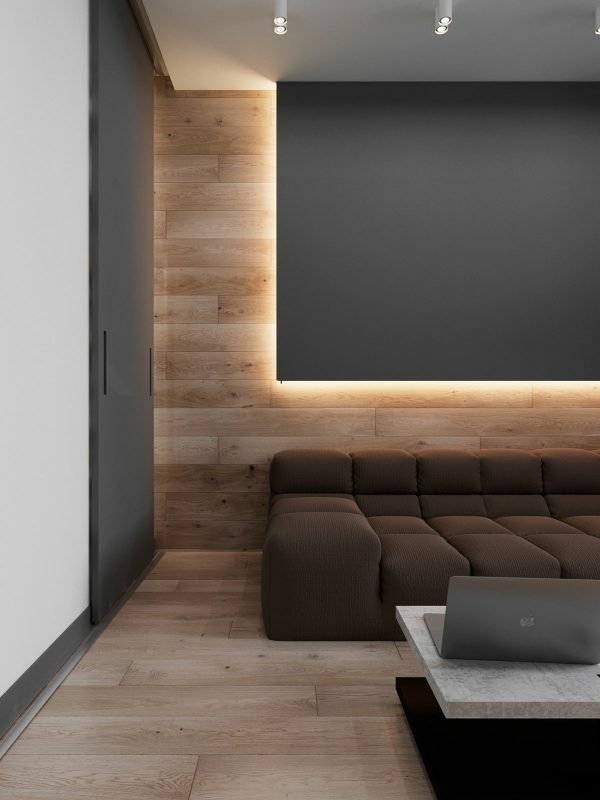 A charcoal painted wall panel is lit around its perimeter, sending a glow out over surrounding timber wall planking. 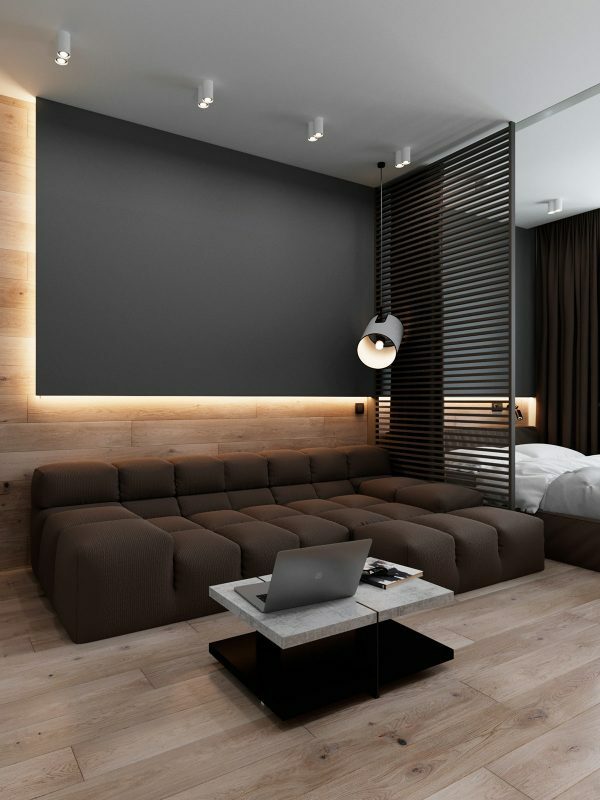 A modern wall light descends in front of the accent panel, illuminating the chocolate coloured sofa below. Dark grey paintwork makes a stripe across the base of the tv wall too, and down over the doorway. Wood planks reach from the wall treatment onto the floor. The charcoal wall panel in the lounge continues straight past the partition screen into the bedroom. 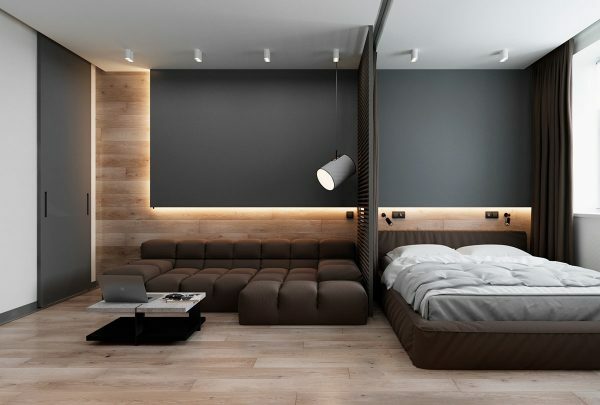 The panels perimeter lighting casts a cosy glow over the headboard. 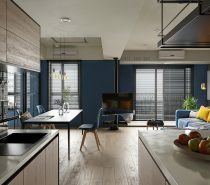 The home has a completely separate kitchen diner, which is also decorated in shades of monochrome, wood tone and chocolate brown. 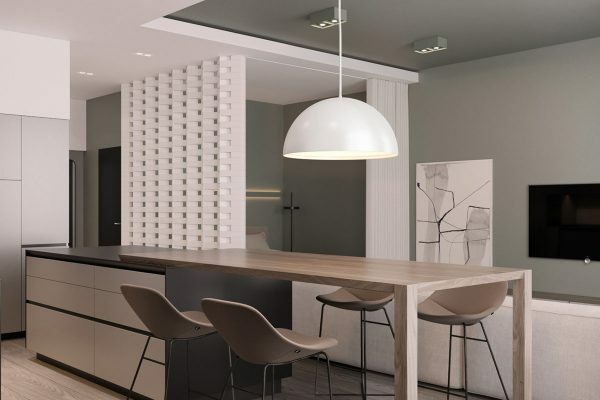 Sculptural dining room pendant lights create light pattern over a grey accent wall. Modern wall lights brighten the entryway. A modern bench seat stands poised by the door. 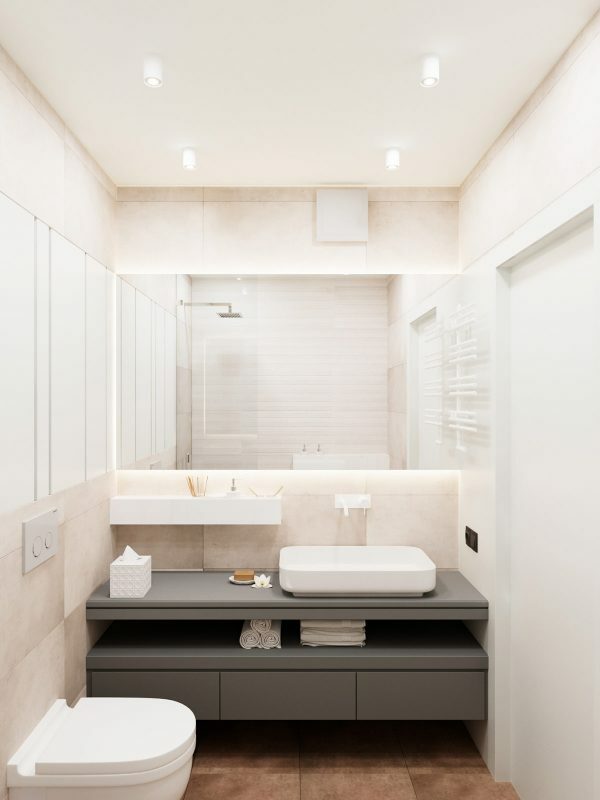 A made-to-measure vanity runs the full width of a grey and white bathroom. Home plan showing the separation of space, including a dedicated home office. 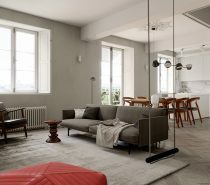 Last up is a 56 square metre apartment redesign in Odessa. 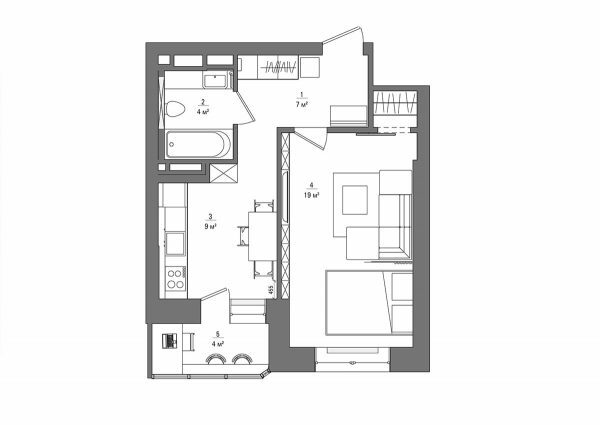 This is a studio apartment with adjoined sleeping area, kitchen diner and lounge. A patterned rug makes an island for the sofa, nesting coffee tables, and a media cabinet opposite. 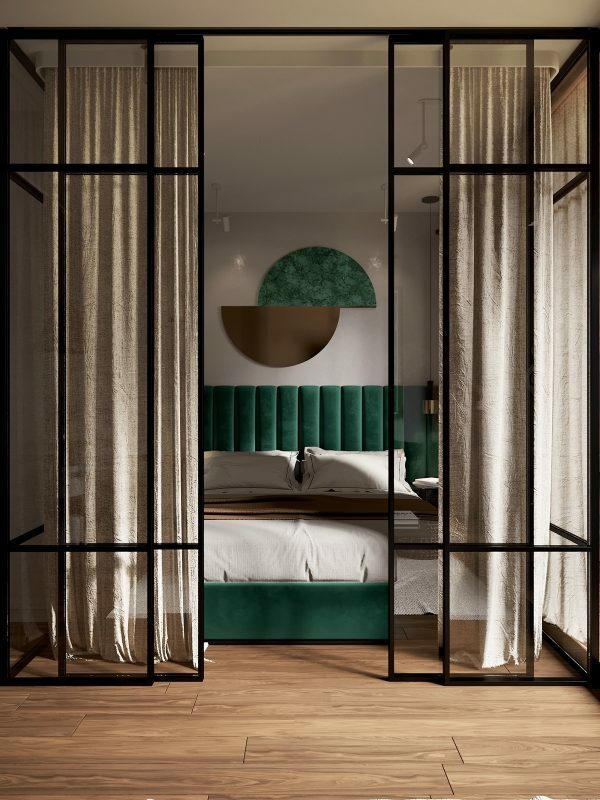 The sleeping area is partially screened from the main entryway by a sculptural partition wall. A portiere hangs as the bedroom door. 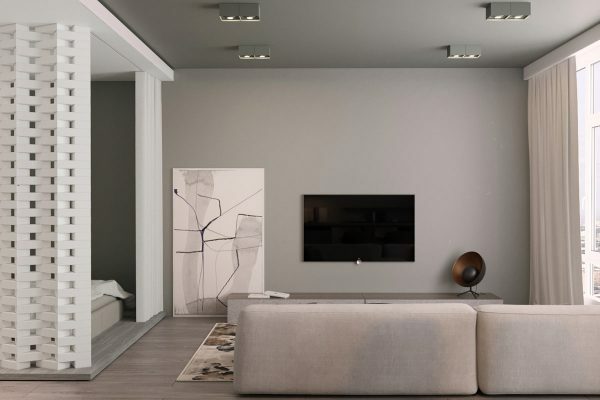 A soothing shade paints the wall and ceiling of the grey living room. The natural light from the living room window shines through into the bedroom when the portiere is open. Bar stools stand at a high dining bench, which attaches to the countertop of the kitchen island. A white dome pendant light marks the eating area. 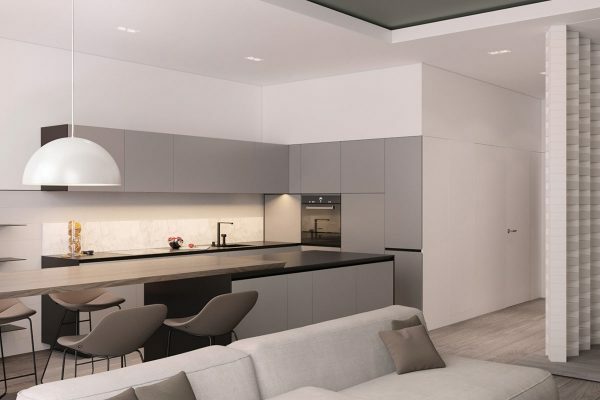 Light grey kitchen cabinets run in an L-shaped arrangement around the central island. 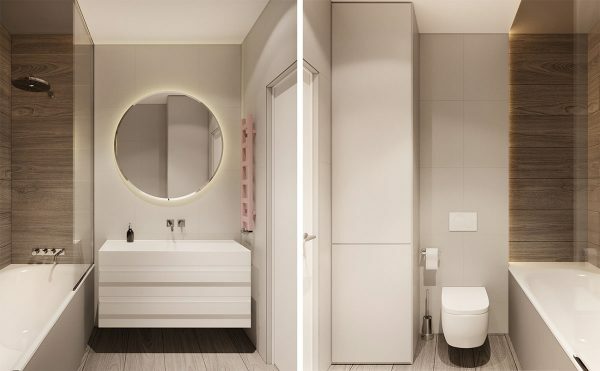 In the bathroom, a sweet pop of pastel pink comes in the form of a heated towel rail beside the vanity mirror.